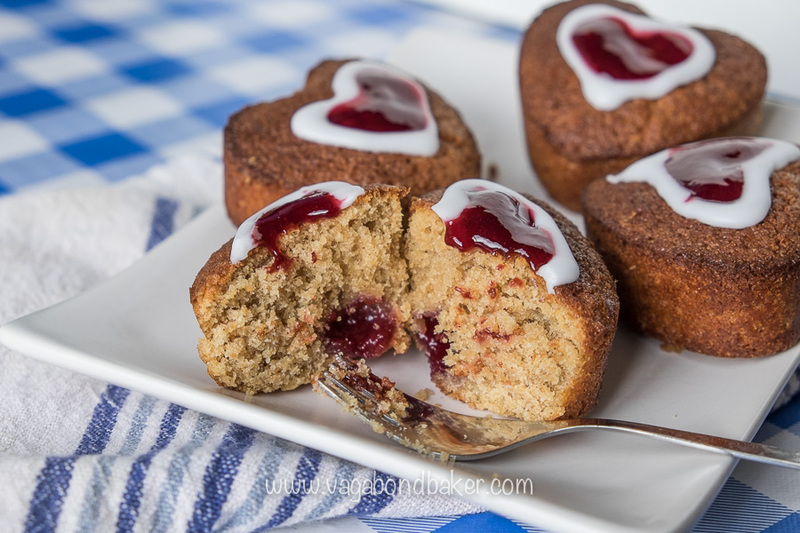 These cute little cakes are absolutely delicious: sweet, moist and lightly spiced with a heart of jam that’s both inside and on top. 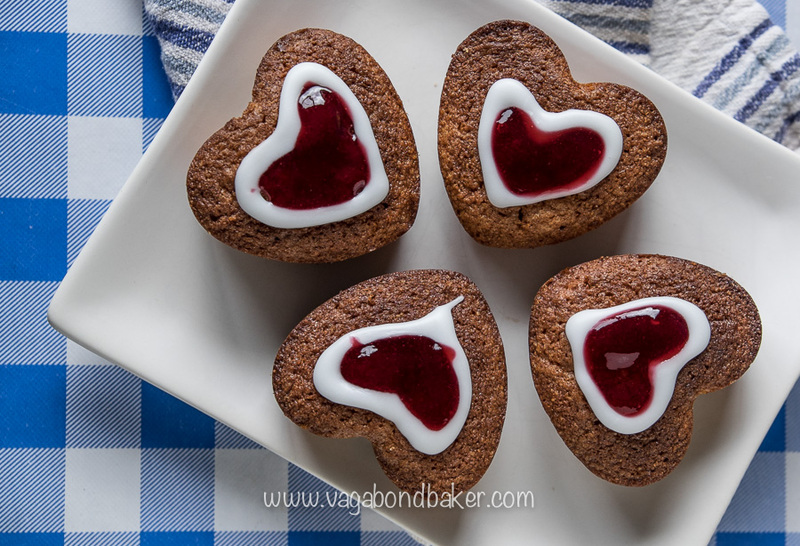 Runeberg Cakes, or to give you their Finnish name ‘Runebergin Tortut’, are traditionally baked to celebrate the birthday of Finland’s National Poet Johan Ludvig Runeberg on the 5th February. It is said that his wife created the cakes using whatever ingredients she had in her larder: they are my new favourite way to use up breadcrumbs or stale cake! Crumbs of whatever you have to hand – be they bread, cake or biscuit – are made into a cake batter along with ground almonds. Gingerbread cake crumbs are very popular for this recipe as they impart a lightly spiced favour to the cakes. I used fresh white breadcrumbs as that is what I had and they worked perfectly. You can tweak the spices to you own tastes: I used ground cardamom but ground ginger or mixed spice would be equally good. The baked cakes are doused in a sugar syrup flavoured with rum, or traditionally arrack punch, I used Jack Daniels – again, as it was all I had to hand – and that worked deliciously too! This liquor syrup makes the cakes super moist; a non-alcoholic version can be made with fruit juice. 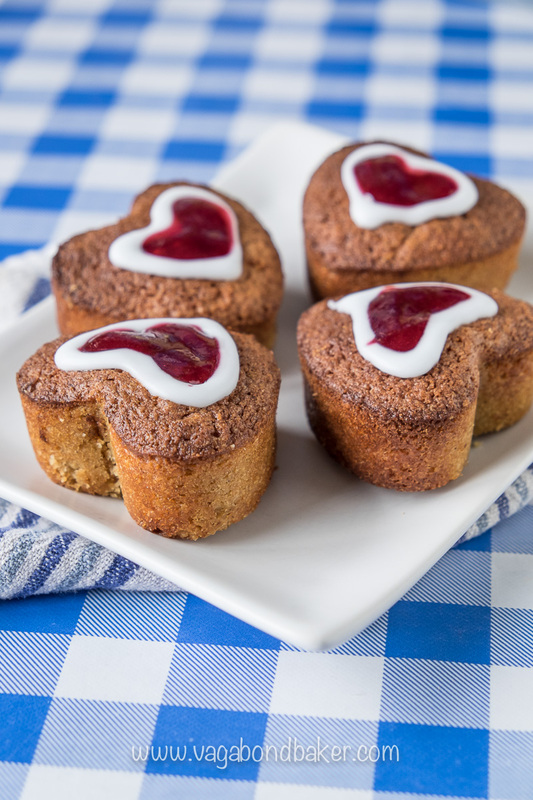 Runeberg cakes are traditionally baked in cylindrical tins but muffin tins are probably more common in home baking. I wanted to bake mine in a silicone heart-shaped muffin tin, to share my love of Finland in cake-form! I came across Runeberg cakes in a gorgeous little cafe in Porvoo, a beautiful old town an hour away from Helsinki. The girl working there gave me the town’s tourist brochure to read while I had a coffee, and inside was a recipe for these cakes. JL Runeberg spent most of his life in Porvoo, and Runeberg cakes are sold throughout the year in many of the town’s cafes and bakeries as a celebration. The cafe – Cafe Klockan – had a plate of the cakes and, of course, I had to try one (even though I’d already eaten a Finnish doughnut with my coffee). The cake was surprisingly moist and full of flavour, I couldn’t wait to have a go at making them for myself! Having never made them before, I now know the recipe off heart! Why? Well, I’ve made quite a few batches this weekend, first because I tinkered with the recipe too much and the cakes didn’t hold their shape, then a few more times because the cakes kept sticking in the silicone muffin pan I was using. They didn’t look particularly photogenic! By bake four I’d nailed it. Greasing the silicone pan still hadn’t worked, the bases of the cakes were staying put when I turned the cakes out, even after leaving them to cool completely before I did so. The solution I found was to pop the semi-cooled cakes, still in the muffin pan, into the freezer for half an hour: they popped out perfectly after that! I think the problem was partly down to the cakes being so soft and crumby, they don’t have such as strong structure like some other sponges. Notes about the recipe: this recipe is based on the (slightly vague) one in the Porvoo Visitor’s Guide, although I’ve played with it a little. The crumbs are in a volume measurement rather than a weight measurement as different crumb types don’t weigh the same. I sieved the jam to remove the seeds, because I prefer it like that. Preheat oven to 200º C / gas 6 / 400º F and grease (or line with paper cases) a 6 hole muffin pan. Makes 6 cakes. Cream the soft butter with the two sugars until pale, beat in the egg. 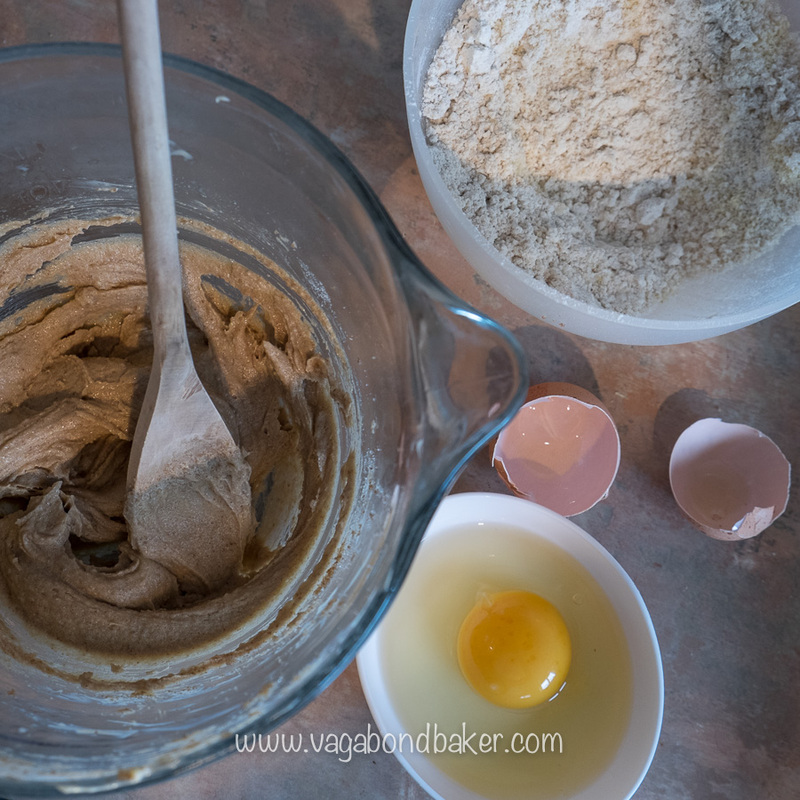 Combine the flour with the baking powder and the ground cardamom then sift into the batter. Add the crumbs and the ground almonds and mix everything together really well then stir in the milk. 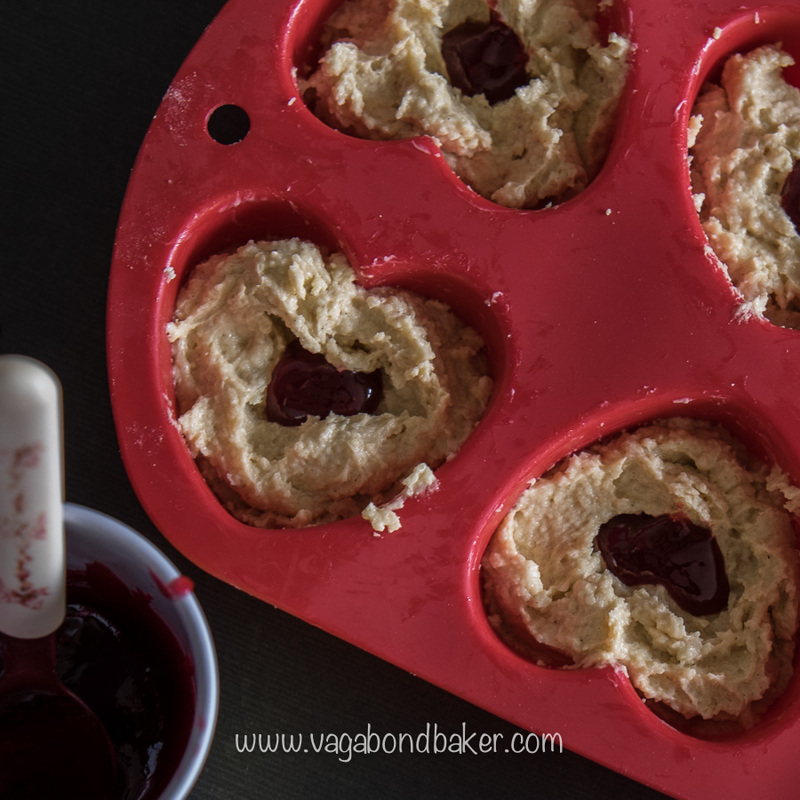 Divide the batter between the six holes in the muffin pan, make a shallow dip in each one and drop a blob of jam into each one. Bake in the preheated oven for 18 to 20 minutes until risen and bronzed. 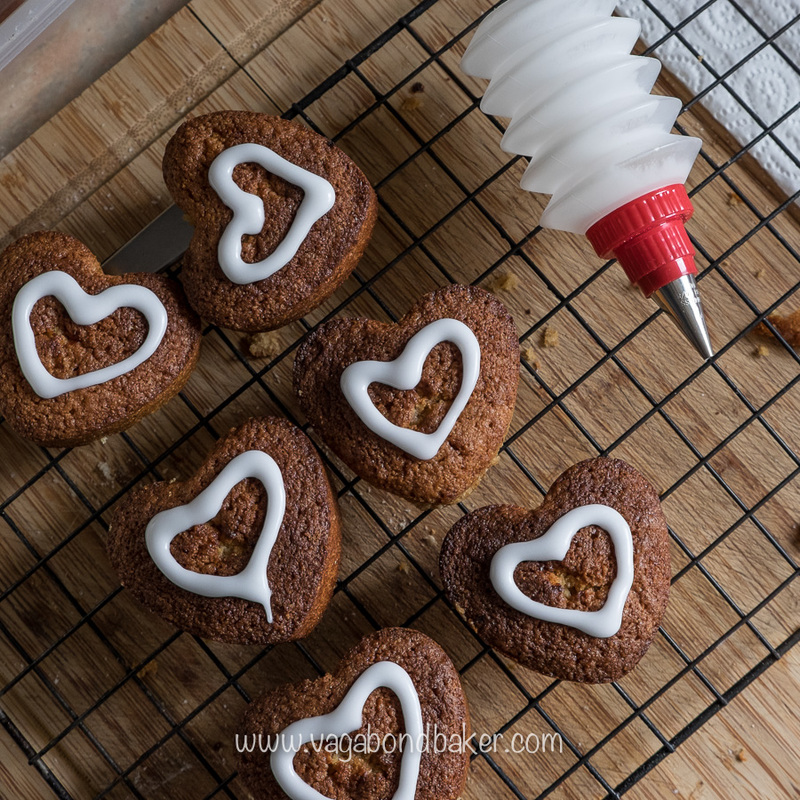 If using a silicone pan, leave to cool completely in the pan before turning them out, the cakes are light and crumby and they might stick in the pan. I would recommend popping the pan in the freezer for 30 minutes, once mostly cool, to firm up the cakes for a cleaner release. Meanwhile, make the sugar syrup: place the water and sugar into a pan and heat until the sugar has dissolved and the liquid turns a little syrupy. Stir in the rum. Once the cakes are out of the pan, spoon a tablespoon of the syrup over each of the cakes to soak in and moisten the sponge. To make the icing: Sift the icing sugar into a bowl and add enough water to make a thick icing. Pipe a ring or heart with the icing onto each of the cakes. 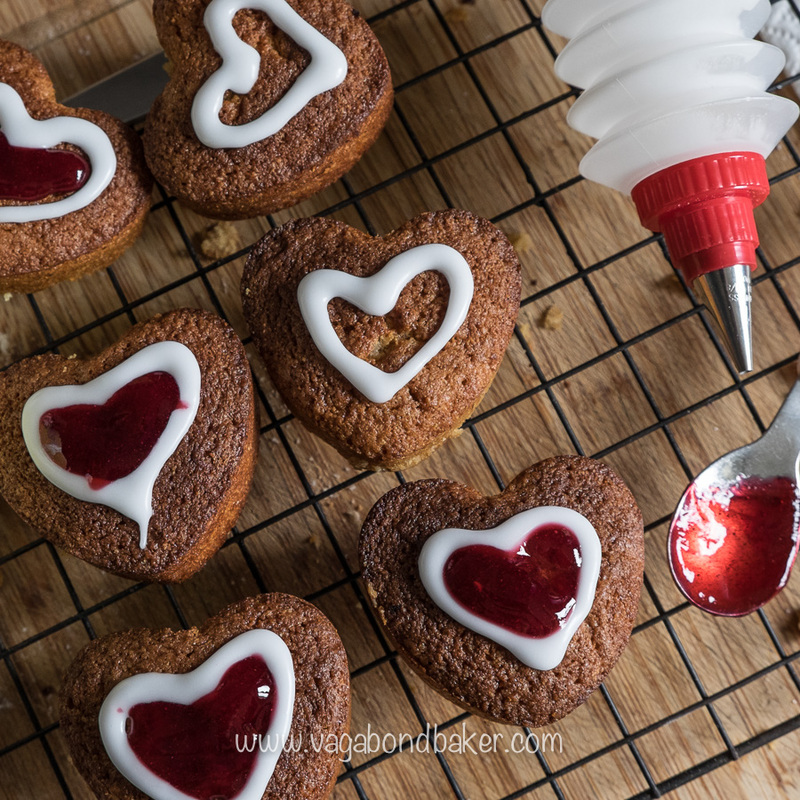 Once the icing has set (a minute or two) fill the ring/heart with a blog of jam. Your pretty Runeberg Cakes are ready to serve and impress everyone! Preheat oven to 200º C / gas 6 / 400º F and grease (or line with paper cases) a 6 hole muffin pan. If you are using a silicone muffin pan, allow the pan to cool a little then try popping it into the freezer for 30 minutes for the cakes to come out without sticking. Pin this delicious recipe for later! Similar posts you might be interested in, don’t disappear! Helsinki: The Thought Of Leaving Was Unbearable I lay my heart out to this beautiful city. Korvapuustit Finnish cinnamon rolls! Amazing! Tampere: Finnish Sauna, Finnish Food and Finnish Snow my friend introduces me to Finnish culture! Semlor: Swedish Almond Cream Buns these Lent buns are delicious! (Inspired by Hong Kong) Coconut Tarts a bake from the far east! 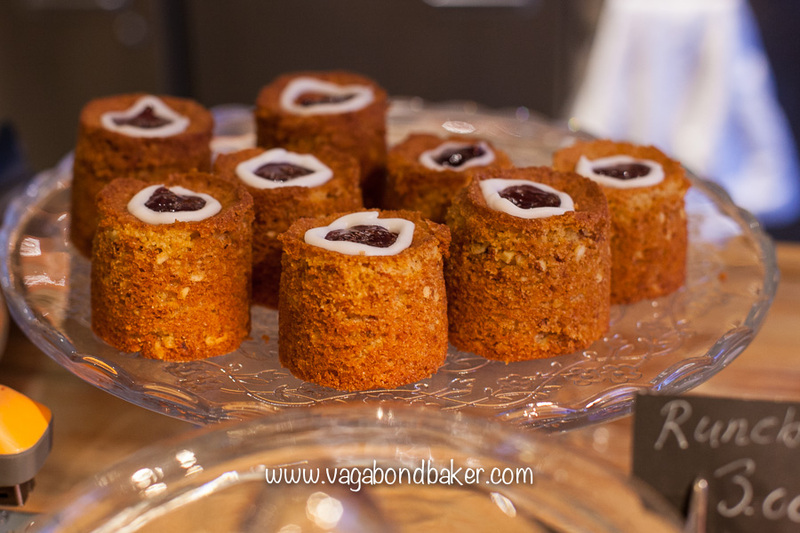 Have you tried Runeberg cakes? I’m going to have to open up more tourist information leaflets if they include recipes inside of them! Obviously I’ll substitute the eggs and butter for a easy vegan replacement, but I might just give these ago during our current house sit. Yes, I’m sure they can be veganised! Let me know if you do! There is a vegan recipe for them on You Tube, I watched it a few weeks ago. Thanks Sus! Just travelling the world, collecting recipes and foodie ideas is the winner! I’m so addicted to cardamom now that I’ve been putting it in everything (much to the slight annoyance of Mr VB!). They are so sweet! Great photos. Thanks Janice! I really wanted them to be heart shaped, I’d visualised their cuteness weeks ago! These look fabulous. I’ve bookmarked the recipe in Trine Hahnemann’s book, so it’s good to hear what you have to say about them and a good tip about how best to get them out of the moulds. I baked a cake from her book with rye bread recently – it turned out beautifully. A great way to use up stale bread. Wow, brilliant! That sounds like a great recipe book, yum to Nordic baking: I’m obsessed! I’m happy to share the tip, I found getting them out the silicone mould so frustrating, I was just happy I had enough ingredients for make that many batches!